On Monday, the Washington Post published a story about the changes on 14th Street. CNHED’s office is located in an alley off of 14th and U St, so at CNHED the change has been impossible to miss. Biking to work means dodging construction sites and restaurant delivery trucks parked on the street. It also means noticing a constant stream of transformation: empty buildings and vacant lots become restaurants and condominiums, businesses change hands to serve a richer clientele, and apartment buildings attract new occupants. As the Housing For All Campaign organizer, it’s my job to know about the affordable housing success stories. Our neighbors on T Street purchased their building to create the first Latino-owned tenant cooperative 20 years ago, so they remain in the neighborhood. Recently, tenants at the Norwood on N Street successfully followed in their footsteps and purchased their building. Across 14th Street from them is one of DC’s premier providers of service to homeless women: N Street Village. But these affordable housing and services are being overwhelmed by the housing market forces that are sweeping 14th Street. (Symbolically Central Union Mission is relocating and its 14th Street home is being developed as high-end condos.) The handful of affordable apartment buildings that have been preserved over the last few years hardly compare to the 1,200 new high cost units being developed in the area. With condos selling at $900,000 for two bedrooms and rents of $2,700 a month, these rates are unaffordable to the majority of current DC residents. Let’s be clear: gentrification in overdrive has serious negative consequences, particularly for residents with lower incomes. Yes, the 14th Street development explosion is amplifying a vibrant street dynamic, producing tax revenue for the District, and creating lots of new jobs (though mostly low wage). 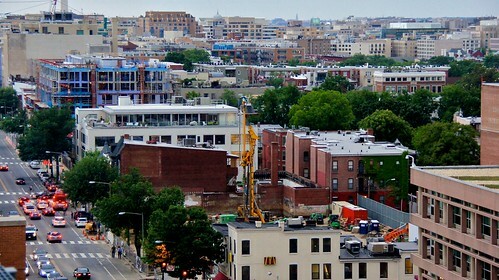 But 14th Street is demonstrating what’s happening around the District: businesses are scrambling to house and serve the influx of more wealthy, educated people who are arriving at over 1,000 people a month, while low-income tenants are pushed to the outer edges or outside the city to find a place they can afford. At CNHED we believe that all District residents deserve housing at a price they can afford. We are concerned that not enough housing is being built or preserved that serves the needs of current residents with lower incomes. We urge Washingtonians – united across all income levels – to call on our government to take greater strides to ensure there is housing affordable to all District residents. The Housing For All Campaign needs you! Click here to join today.